Due to these questions I decided to sit down this last couple of days and put together a short report that lifts the lid on SEO and provides you with a solid “whitehat” way in which to rank your sites. In this new report I not only outline an overal blueprint, I also tell you why each area is effective. 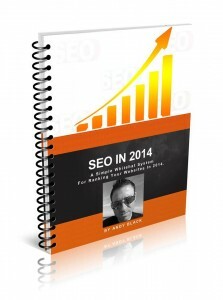 Want a Copy Of My SEO Report? Part of my report teaches you how to build your OWN small private blog network which is a “part” of my overall ranking strategy. This gives you EASY access to the types of links that aren’t so easy to obtain. Don’t worry, this is all explained in my report. The software that is being released on Monday (Instant Domain Sniper) allows you to find GREAT domain names that have good “Domain Authority”, “PageRank” and everything else that matters (again, this is all explained in my report). In fact it does SO much more and I’m going to be releasing a demo on Sunday so keep your eyes peeled for my email. These domains are perfect for building your own network and can yield HUGE ranking power. Members can also share other SEO strategies, case studies or anything else they like. Access to this group is part of my BONUS for when you invest in Instant Domain Sniper. After investing in Instant Domain Sniper you will gain instant access to my report and also the private group. This will give you everything you need to put a plan in place and execute it. Are you ready to take action? Are you ready to start ranking your sites higher than ever before? Are you ready to join my small, private SEO community? Then keep an eye out for for my email on Sunday where I will give you a sneak peak inside the unreleased “Instant Domain Sniper” software. If you love what you see and like the opportunity that I have presented to you then you will be able to jump in on Monday when the doors open. If you have any questions – Please feel free to leave a comment below and I’ll be happy to answer them. Joshua Zamora has JUST released his brand new “Zamorai Video Bootcamp” course which teaches you his simple 5-step forumula for ranking videos on the 1st page of Google. I know Joshua personally and he always produces great products and he originally entered this marketplace by “ranking videos”. I’ve just had a sneak peak inside his members area and it looks like he has 4 video sessions and a case study… Plus mind maps and everything else to coincide with his training. If you have a spare 10 minutes then you can check it out HERE. Can not wait for this I think the free report will be assume by itself! how do i access Instant Domain Sniper..